Just two months ago, our nation’s capital was over-flooded as half a million people crowded Independence Avenue to march for issues that affect women, immigrants of all statuses, those with diverse religious faiths, people who identify as LGBTQIA, Native and Indigenous people, Black and Brown people, people with disabilities, the economically impoverished and survivors of sexual assault (Women’s March on Washington Facebook page). Many GW students also participated in the March, including me and other sisters from Pi Chapter. 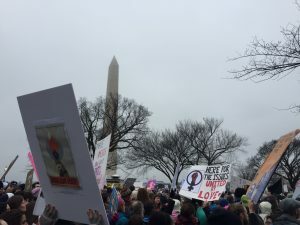 And although the March itself felt empowering and motivational, I was afraid that the momentum of the Women’s March would stop there– that millions of people around the world had rallied for this campaign that was blasted across social media, but that this energy would die down in the following weeks. However, my Facebook feed told me otherwise. On the morning of March 8th, a notification reminded me that it was “International Women’s Day.” After a little research and asking around, I found out that this international campaign was a day dedicated to calling for a more inclusive gender equal world and celebrating the numerous ways in which women have achieved social, political, economic, and cultural success. In D.C., many businesses closed their doors for the day as female employees participated in “A Day Without a Woman.” I saw some of my professors, friends, and sisters, sending encouraging messages on this day, and I was reminded to appreciate all the strides women have made throughout history and to celebrate the important accomplishments of the women closest to me. Inspired by this renewed energy, I decided to interview one sister I admire particularly for her dedication to feminist values. She has taught me and my line sisters the importance of our sorority’s values and how it connects deeply to female empowerment. And most importantly, she has been a role model as a strong leader, inspiring me and the women around her that we are capable of great things. Please allow me to introduce our beautiful alumna, Ashley “Sakarya” DaCosta!! Nanami: What does it mean to be a woman, in your opinion? What is the most rewarding thing about being a woman? Ashley: This question is interesting because in my eyes it’s akin to asking, “What does it mean to be human?” There is no monolithic experience as a woman, as there are so many intersectionalities to our gender. As a Caribbean-Black, heterosexual, cisgender, American young woman, I can only truly speak about my experiences and what it means to me to live as a woman. So rather than speak on my personal experiences, I’ll focus on the role of women in society throughout time and how it impacts my identity today. Being a woman is really remarkable in my eyes. Not only are we beautiful, intelligent, and downright magical, we’re also strong, daring, sacrificing, and soft all at the same time. Women are activists, constantly at the forefronts of change and progression throughout history. We’re the backbones of society, the keepers of tradition, the teachers of life. Self-starters, innovators, caretakers, leaders. And of course this is not to say any of this is limited to women, obviously, but just think–while our schooling has highlighted and focused on male achievement, particularly white male achievement in this country, where would any society be without women? There’s a reason why many microfinance charities focus on empowering women in impoverished communities/nations because we are the foundation of the family, the foundation of societies. Also think–everyone loves food so much, but ultimately who was responsible for the development of cultural cuisines, passing down knowledge of how to create dishes, passing down culture from generation to generation? This is something I think about quite often actually, especially in our political environment today with leadership embodying ideas that women are less than and woman are to be controlled. I am filled with indignation everyday when I read stories about the attack on Planned Parenthood or hijabi women facing discrimination as our society loves to police and scrutinize women at every turn. But then I remember the strides made by past generations, the sacrifice and hard work of women, black women. I see my own mother work so hard and overcome anything and everything in her life and I feel emboldened. I feel so empowered through this revelation and no misogynistic or racist ideal will bring me down. I tell myself, while toxic masculinity and parochial values can be a threat to my existence, simultaneously I remember am free to express myself in many ways men cannot, for they fear ridicule as their masculinity is often rooted in sexism, homophobia, and transphobia. I remember how multi-faceted and interesting I can easily be as I am not bound to the same strict societal rules of expression as men. I remember all these things and I feel so strong, sure, and proud in my identity as a woman. Nanami: How has Sigma Psi Zeta helped you grow as a woman and in general? 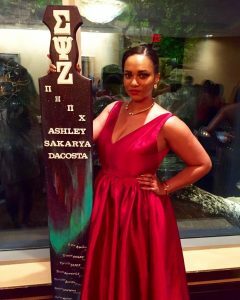 Ashley: Being a sister of Sigma Psi Zeta Sorority, Inc. has been both challenging and rewarding. Coming from a culture that is very different from most Asian cultures, I was met with new challenges when I was first initiated into the sorority, particularly regarding communication. I quickly learned throughout my time as an undergraduate sister how vital good communication skills are to your success in just about anything you do in life and I have continuously worked to be able to adapt my communication style as needed when interacting with people of all backgrounds so I can be better understood and better lead. Nanami: Who is a female figure you look up to and why? Ashley: I have never really had intense admiration for any public figure, but I have deep respect for any woman in any field making strides to better our greater community. To name a few, I think public figures such as Laverne Cox, bell hooks, Elizabeth Warren, Joy Reid, Michelle Obama, and Oprah are exceptional in who they are as people and the work they do to help others. The only true female figure I really aspire to be like is my mother. It sounds corny and cliche, but if I sat you down and told you her life story you would find her just as incredible as I do. I don’ know how she does it…shoulders so much responsibility, looks after so many people, is so giving and generous, strong and capable, just….a warrior in many ways. If I can grow to be as successful as my mom as been, I will have lived a very fruitful and satisfying life. Nanami: Finally, what do you think about International Women’s Day? Ashley: International Women’s Day is a great initiative and it needs more recognition on a local level particularly at companies. For example, during Black History Month, my mom’s company did recognize it by highlighting the achievements of black employees, but my company did not do anything for it. I think all large companies should recognizeinitiatives such as this. Actually the company I work for is a minority and woman owned business, so it is a shame that nothing is done for International Women’s Day. Inspired by this post? Want to make a change and actively participate in female empowerment? Join “Fit to Fight” instructor, Angela Meyer for an evening of Women’s Self Defense. This will be a safe, fun, challenging and transformative experience, in an all female environment. This workshop will expand your physical, emotional and mental limits, while teaching you basic techniques and skills that will build your confidence and strength as a woman in DC. Come join us in this rally, speak-out, performance, and candlelight vigil as we call for an end to sexual violence and gender-based violence of all forms. We will have members of the GW community and local DC-based non profit organizations speaking on this issue. All proceeds we fundraise will be donated to local organizations that combat sexual violence. The Always Aspiring Alpha Alpha Class Has Arrived!